The timing of discussion was announced by European Commission spokesman Margaritis Schinas. Germany was the first country to support the idea voiced by EU Commission president Jean-Claude Juncker. German government representative Christiane Wirtz said that Chancellor Angela Merkel is open to the project of a European Union joint army, but stressed that such a plan cannot be immediately realized. The proposal is not exactly new; it was on Juncker’s agenda during his election campaign, but appeared even earlier in 2013. In December of that year, British Prime Minister David Cameron said: "It isn't right for the European Union to have capabilities, armies, air forces and the rest of it. We need to get that demarcation correct between cooperation which is right and EU capabilities, which is wrong." The financial aspect, however, has raised doubts even among supporters of the idea. Finland’s Foreign Affairs Minister Erkki Tuomioja told local media Yle that European countries do not have the opportunity or funds to create a joint armed forces. He stated that while the idea is attractive for the long-run, it could not replace the armies of certain countries completely. There are also concerns whether the new unit is needed, as there is already military cooperation within NATO. The bloc’s members must allocate a minimum of two percent of GDP on defense spending – a requirement which not all of them can meet. 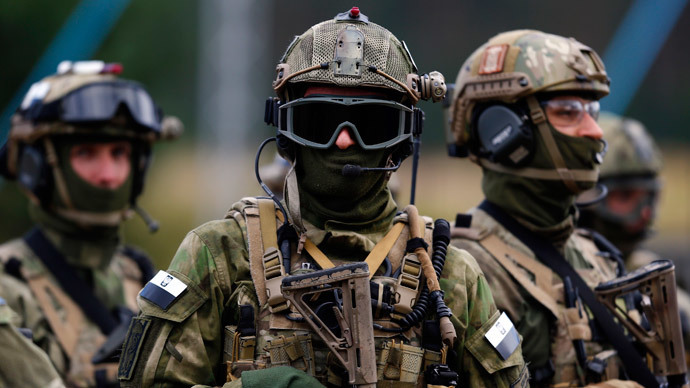 Estonia’s parliament foreign affairs commission chairman Marko Mihkelson also supported this stance, saying the proposed army would simply duplicate NATO and not strengthen European security. “Those European Union countries which are also NATO members should just increase their defense spending within the NATO budget. Any kind of duplication or creation of new structures will not increase Europe’s safety. Vice versa it may serve to the benefit of those who would be happy to see confrontation between the European Union and the US or cancellation of transatlantic cooperation,” he told Delfi website, as quoted by RIA Novosti. The statement was made at a time when the US shipped 120 armored units – including tanks – to Latvia, to improve the Baltic country's defenses. A new round of military drills should also begin in the Black Sea; six NATO warships arrived there on Wednesday to take part in exercises with the Bulgarian, Romanian, and Turkish navies. European Commission President Jean-Claude Juncker believes an EU army could help counter a possible threat from Russia. He also said that EU’s image "has suffered dramatically and also in terms of foreign policy, we don't seem to be taken entirely seriously." “The context today, of course, is different. The conservative forces within Europe want to establish themselves again as an entity next to the US. This idea floated by, and it is not just aimed at Russia, it is aimed at the US as well. Conservative forces don’t like the whole idea of America dominating Europe,” he told RT.